On September 16, 2014, Vehicle Code 21760 “Three Feet for Safety Act” went into effect. 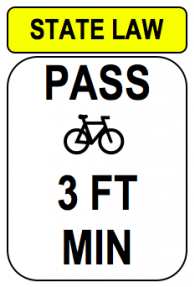 This new code requires motorists to give at least three feet of clearance when passing people riding bikes. When passing with a three foot buffer is not possible, this new law requires drivers to slow down to a safe and reasonable speed and wait to pass only when it was safe to do so. The new law will provide greater protections for bicyclists by recognizing their greater vulnerability and enforcing fines for infractions.